A fascinating feature in London's Financial Times today on what the evolving history of glassware reveals about our changing attitudes to alcohol. Polly Russell, a curator at the British Library, explains how wine glasses, like wines, go in and out of fashion. But whether you prefer the newest trend in stemless tumblers or the voluminous style of the 1990s, one thing has marked their evolution. Over time, wine glasses have increased in size. 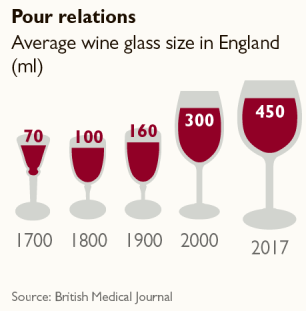 In a study published in the British Medical Journal last year, researchers investigated wine glasses between 1700 and 2017 and discovered a sevenfold increase in volume. We cannot infer that the increase in glass size and the rise in wine consumption in England are causally linked. Nor can we infer that reducing glass size would cut drinking. Our observation of increasing size does, however, draw attention to wine glass size as an area to investigate further in the context of population health. The amount of alcohol people drink, particularly wine, has increased sharply since the 1960s. Along with lower prices, increased availability, and marketing, larger wine glasses may have contributed to this rise through several potentially co-occurring mechanisms. It concluded with three key messages.